Ann Grimes is an award-winning veteran journalist who has held senior editorial positions at The Wall Street Journal and The Washington Post. As the Journal’s Deputy Bureau Chief in San Francisco, she oversaw the newspaper’s coverage of Silicon Valley during the 1990′s dot-com boom and bust and wrote about tecnology, venture capital, and entrepreneurship. While at Dow Jones & Co., she also worked on developing new media strategy. At the Post, she served as the Deputy National Editor responsible for coverage of the federal government and ran a national news section that covered the political spectrum. Starting out, she wrote about social issues in Chicago and contributed regularly to The New York Times. Grimes is the author of Running Mates, a book about the 1988 presidential campaign, published by William Morrow & Co.
Grimes lectures on media and entrepreneurship at Stanford’s Graduate School of Business. She also has taught in Stanford’s Department of Communication and at the University of California, Berkeley Graduate School of Journalism. She has a B.A. in English Literature from Georgetown University and an M.A. in Humanities from the University of Chicago. 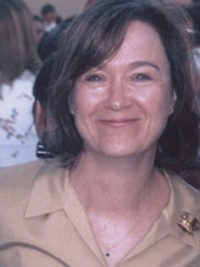 She was a 1997-1998 John S. Knight Fellow at Stanford.